The one question that is being echoed by all the Vijay fans for the past few days is “Eppa Sir Trailer ah release Panuvinga”. But the Kaththi team has so far not made any promises regarding the trailer release date. But now we hear that, team Kaththi is all geared up to sprinkle a surprise treat for all the fans today as the song promos will be released before the trailer of the movie. Team Kaththi has confirmed this news in their official social networking forum. How excited are you to catch a glimpse of our Ilayathalapathy’s dance movements today? Breaking - The VIP combo is back for another blockbuster? Will Sivakarthikeyan make it four in a row? Will 2, 3, 4 & 5 work for Hari and Suriya ? 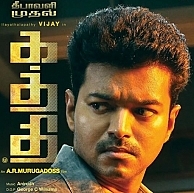 Kaththi Will Be Ten Times Of Thuppakki ! U Certificate For Kaththi ! Ilayathalapathy Vijay - AR Murugadoss Project Kaththi Is In Safe Hands ! People looking for online information on Ilayathalapathy, Kaththi, Kaththi Promo Songs, Kaththi Trailer, Vijay will find this news story useful.